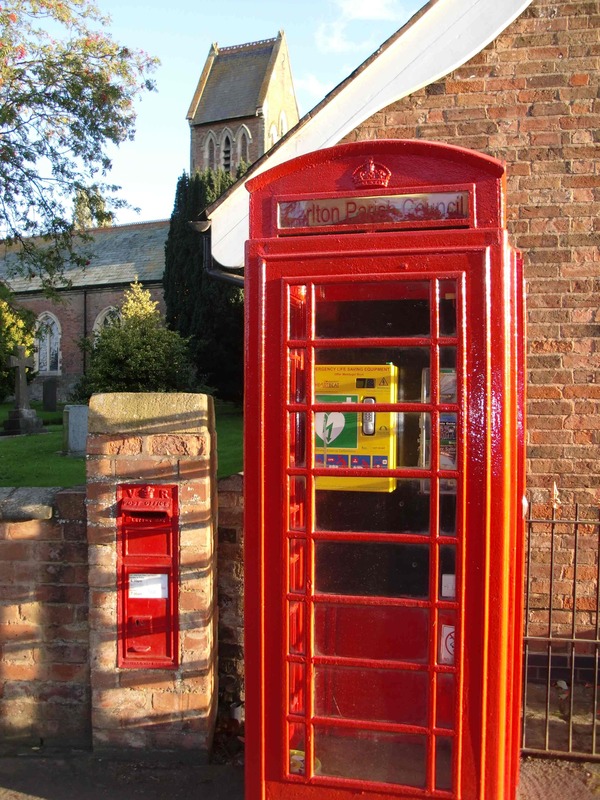 A REDUNDANT village phone box in the Leicestershire village of Carlton is to remain a vital lifeline for villagers who use it to house a defibrillator machine in the booth, supported by a village responder group. The challenge for any local response group is how to be contacted in the least possible time. The solution found in the Carlton, where a community defibrillator has been installed by the Community HeartBeat Trust, is to use an internet phone working off a broadband modem to enable rapid and easy communication amongst the village responders. Carlton has six volunteers willing to respond in the event of a Cardiac Arrest in the village. Each volunteer responder has been trained by the local community first responder team in how to recognise a Cardiac Arrest, and how to undertake CPR and administer the defibrillator. Each volunteer has a standard cordless BT phone attached to an adapter that is plugged into a broadband modem. All of these adapters are programmed to the same telephone number. When there is an emergency in the village 999 is always called, followed by the village emergency number which rings simultaneously every one of the six phones. The first volunteer to answer takes the call and all other phones stop ringing. The first volunteer will take all the details and rush to the patient and commence CPR. En-route he will call the village emergency number again and the next volunteer will rush to collect the defibrillator, or to assist as required. The defibrillator is positioned in the local telephone box, central in the village. This saves precious time and there is a second volunteer on hand to assist. The local ambulance service also has the village emergency number and can call for assistance from the local village responders as well. If volunteers change, the adapter and phone are given to the new volunteer. As soon as they plug the adapter into their broadband modem their phone will ring simultaneously with the other volunteers’ phones. This innovative service has been organised with Voipfone (www.voipfone.co.uk), an internet phone provider. Each line (extension to the main number) costs £1.16 per month per volunteer. The adapters (Cisco PAP2T) cost around £50. Voipfone provided these and programmed the number in so they are ready to use. A cordless phone costs around £20. Nigel Axelrad, the Carlton scheme co-ordinator, stated “We have worked with the Community HeartBeat Trust and our local CFR group to have a village defibrillator, positioned in the village telephone box. We had a challenge to see how best we could communicate in the fastest possible way amongst the village responders and this method suited our village well. We would recommend this approach to any similar cPAD scheme”.